Premier has got it! We are leaders in the manufacture of quality machinery parts and attachments for construction, industry, and agriculture, to provide the tractor attachments and accessories you require for productive, lucrative multitasking. Skid steer loaders are made for attachments. Premier guarantees you will not find higher-quality attachments or accessories for skid steer loaders at a more competitive and affordable price than those made by us! Mini does not mean under-powered! Our attachments and accessories make any mini skid steer loader into an efficient machine. And it won't cost you an arm and a leg either! Thanks to our extensive experience as a top manufacturer of machinery parts, attachments, and accessories for construction, industrial, and agricultural use, we know a thing or two about production efficiency. At Premier we get that you may use your excavator for far more than excavation. We have just the excavator attachments and accessories you require to bolster what you can do – without burning a hole in your wallet. Specifically, we engineer a line of both medium-duty and heavy-duty high-flow Earth Auger Drive Units that go amazingly with all sorts and all brands of excavators. Many jobs can be done with a mini excavator - as you undoubtedly already know. Equip it with the right tools and it can help you finish a diverse set of construction, industry, or agricultural jobs. Not many (if any) tools are more right for expanding your list of abilities than our Earth Auger Drive Units or Trenchers– the ultimate in mini excavator attachments and accessories. 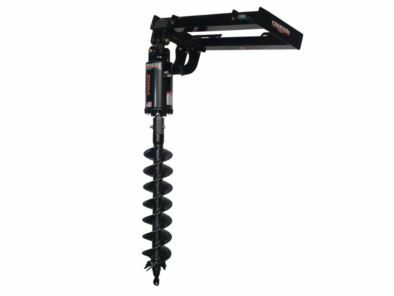 Premier's Backhoe loaders are great general-purpose tools, and not a thing increases their applicability like Premier backhoe attachments and accessories. First, they have a renowned for being among the best designed and manufactured in the industry. Also, they’re priced competitively, which is a real benefit to construction, industry, and agriculture companies who want exceptional equipment but also like to get the best bang for their buck.